"The House That Sam Built," an exhibition now on view at the Boone Gallery of the Huntington Library, Art Collections and Botanical Gardens in San Marino isn't really about a house, and it isn't entirely about the late woodworker of genius Sam Maloof. "Its a show about community," notes the Huntington's Curator of American Decorative Arts, Harold "Hal" Nelson. Nelson, who has been shepherding the show towards fruition for nearly a decade, got the opportunity he needed under the aegis of the Getty Foundation's "Pacific Standard Time" initiative, a collaborative attempt to tell the story of the birth of the L.A. Art Scene. The part of the story Nelson has been wanting to tell concerns the vibrant network of influences and exchanges that developed in the postwar period in the Pomona Valley, 30 miles from downtown Los Angeles. The presence of educational institutions -- most notably Pomona College, Scripps College, and Claremont Graduate School -- drew a cadre of accomplished artists and artisans to the area, where they met, befriended, and often exchanged works with Sam Maloof, who had his studio just east of Pomona in what was then rural Alta Loma. Maloof, a gregarious and generous man, is quoted on the back of the show's catalog as explaining "I want to be able to work a piece of wood into an object that contributes something beautiful and useful to everyday life. And I want to do this for an individual I can come to know as a friend." Successful beyond his modest early expectations -- in craft and in friendship -- Sam and his first wife Freda filled their home with ceramics, enamelware, tapestries and woodwork by those they knew. The Maloofs and their home provided a kind of center for what Nelson describes as a "tolerant community" in which the various exchanges of art and craft represented shows of mutual respect. Given the atomized nature of Los Angeles culture, Nelson notes wistfully that many of us now feel a "hunger for community" of the sort that flourished among the members of this group. Although the show doesn't literally recreate the interior of Maloof's home, it pairs works by his friends with Maloof furnishings in a way that stimulates aesthetic conversations between the objects. For example, a 1968 Karl Benjamin geometric abstraction, "Number 4" radiates controlled intelligence as it hovers above the masterful and sensuous Brazilian rosewood "Double Music Stand and Musician's Chair" which Maloof made for the LA Philharmonic's first violist Jan Hlinka in 1972. Curator Nelson comments that seeing fine and decorative arts displayed together in museum settings is common for items made before the 20th century. "Then," he comments "that idea falls apart," something that the exhibition hopes to rectify. One of the great joys of "The House That Sam Built" is seeing modern art and craft in concert, and the usual categories and hierarchies become delightfully blurred. Sam Maloof's 1958 coffee table is a lovely piece of craft, maybe even a sculpture, but the four ceramic pieces by Gertrud and Otto Natler that rest on it and in front of it quietly out-do it. The quality of the ceramics in the exhibition is breathtaking. The show has many revelations, and one of Hal Nelson's hopes is that the exhibition will help him uncover lost works by some of the exhibition's 35 ceramicists, fiber artists, painters, and sculptors. Or as he cleverly puts it, sometimes these things appear "out of the woodwork." As the public becomes increasing aware that the Pomona Valley had its own modernist Arts and Crafts movement, artists and artisans whose works have been overlooked are bound to be rediscovered. Maloof was a wonder, the exhibition affirms, surrounded by remarkable friends. A Maloof chair awaits exhibition visitors at the Huntington's "The House That Sam Built"
If you are able to visit the exhibition, make sure to pause at the north end of the Boone Gallery where photos of Sam and Freda Maloof are exhibited along with some of the woodworking patterns used in Sam's shop. 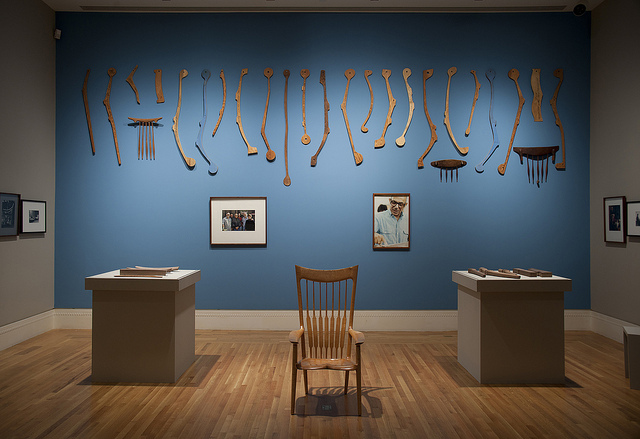 In the center of the room is a maple Maloof chair provided for members of the public to try out. When you sit in it, the man who made it will feel present. "I want that person to know that it was made just for him," Maloof once said, describing how he wanted his furniture to connect him with others, "and that there is satisfaction and enjoyment in the object for us both." Sitting in the chair, you will indeed feel it was made just for you, and that you are among friends. View more installation photos by clicking here.